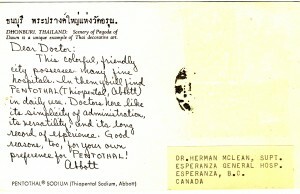 As I now know, this is an example of a ‘Dear Doctor’ advertising postcard, sent by Abbott Laboratories in the 1950s and 60s to doctors and other health professionals. These must have been ‘attention getters’ for sure. You can see that at one time someone had this particular one pinned up, perhaps as ‘art’. I think my mother collected this card at one of the many stamp/collectable shows or flea markets we’ve attended. She’d have been interested in the image of Thailand. When I saw it, I was more interested in the address it was sent to – Esperanza, BC! Esperanza and Esperanza Inlet are on the north side of Hecate Channel, south of Zeballos on the west coast of Vancouver Island in the Nootka Land District, British Columbia, Canada. Apparently the British Captain Cook named ‘Hope Bay’ in 1778, which was changed by the Spaniard Captain Malaspina to ‘Espérance’ in 1791. BC Geographical Names database (citing John T. Walbran, British Columbia Coast Names, 1592-1906: Their Origin and History, published for the Geographic Board of Canada, Ottawa, 1909, as reprinted 1971). According to the official BC Geographical Names database, the name of the settlement was adopted in 1946, changed to Esperanza Landing in 1959, then changed back in 1983. Originally a nearby cannery post office (1926) was called Ceepeecee from the initials of the Canadian Packing Company; the name Esperanza was adopted for the settlement post office in 1960 but it closed in 1974. The hospital there operated from the 1930s till 1974 when it closed. See The Dear Doctor Postcard Collector Page by Tom Fortunato for more about these cards. And David C. Lai has written a book about them, Pentothal Postcards (Mark Batty Publisher, 2005). See the link at the bottom of The Dear Doctor page linked above. 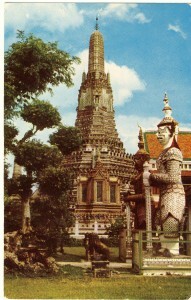 Front of a ‘Dear Doctor’ postcard, titled on the back, ‘Dhonburi, Thailand, scenery of Pagoda of Dawn’ and mailed to Dr. Herman McLean, Superintendant, Esperanza General Hospital, Esperanza, B.C. Canada. The back of the same ‘Dear Doctor’ postcard. Unfortunately someone removed the no doubt colourful stamp, and along with it, most of the postmark. This video, Esperanza Vancouver Island 2009, published by thewestcoaster on YouTube, shows the modern Esperanza and its beautiful location along with historical photographs. For more about the Esperanza hospital and Esperanza today, see these links: BC Christian News and Esperanza Ministries.